Bone pulled off during an ankle sprain. An avulsion fracture occurs when some soft tissue (either a tendon or a ligament) is subjected to an excessive sudden force. A good way to think of this is to imagine a rope that has been nailed onto a plaster wall being pulled on very hard. If everything is solid enough, nothing bad will happen. It might be that the rope is the weakest link and will break – meaning a tendon or ligament rupture. However, if the attachment to the wall is the weakest point and less strong than the pull exerted on the rope, a chunk of plaster will pull free. 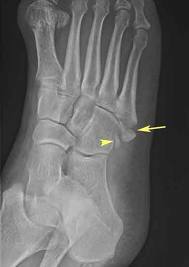 In an avulsion fracture, it is a small bump of bone that pulls loose. This bone injury is more common in children and the soft tissue is more common in adults due to changes in the relative strength of these tissues with age. The presence of growth plates in children also adds to this by providing a weak spot. In the foot, ankle sprains can commonly be complicated in this way. Surgery to pin the bone fragment back into place may be considered if the bone has moved far enough away from its home.